Over two decades after his formative travels around the lands of North Africa that were soon to fall under French control, the lights and colours of Morocco were still burned into Eugene Delacroix's mind. Having seen first hand this world that utterly captivated the imagination of the Imperial nations, the artist used the vast array of sketches and studies to inform and feed a life's work. Painted in 1855 A Moroccan Saddling A Horse is an iconic work of that most troubling of genres; Orientalism. Yet unlike the painters that would make an immense fortune pandering to the style, Delacroix's fascination with the Arab world was driven by genuine interest, respect, and with the hyperbolic sensibility of a French Romanticist. In A Moroccan Saddling A Horse the coiled energy of the beast in formed through the originality of the central composition and of the inability of the animal to decide upon the position it wishes to occupy within the frame. Shunning a strict anatomical approach to form, Delacroix instead preferred to entice the raw energy of his subjects. In 1832 the artist made an ingenious career move, and one which would be copied by generations of budding painters throughout the nineteenth century. As the French nation was becoming increasingly interested in the wealth that could be procured from the lands of Morocco, Algeria, and Tunisia, Delacroix too took an interest in these lands that have ever since been inexorably linked to France. When he arrived he was stunned by the startling scale of color and the unique interplay of light and shade upon the constantly shifting sands of the Maghreb. Upon his return he was inundated with commissions from enthusiasts who demanded a first-hand vision of the proto-colonial lands and their occupants. His 1834 work The Women of Algiers (In Their Apartment) has become synonymous with both the art genre of Orientalism and the academic sub-field of Post-colonial Studies of the same name. Unbeknownst to his audience, Delacroix got over the fact that he found it very difficult to find female models in Islamic North Africa by painting the Jewish population instead. The sketches from life in his many travelogues are predominately men and in its loose form and structure one might infer that A Moroccan Saddling A Horse is taken directly from a study from life during his travels. Regardless of interpretation, Delacroix's works reveal an immense amount about the people he painted for, saying more about his own society than that which he aimed to depict. 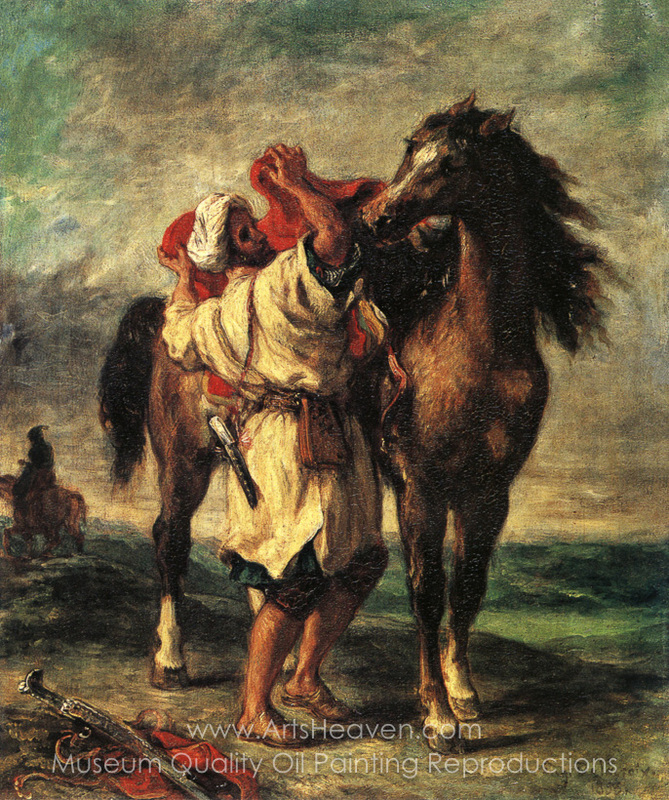 Decorate your home or office with our beautiful museum quality art reproduction of Eugene Delacroix A Moroccan Saddling A Horse painting. Why settle for a print, poster, giclee or canvas transfer when you can grace your walls with a genuine oil on canvas painting reproductions for sale at up to 75% below gallery prices. You are commissioning an authentic hand-painted oil painting on quality artists canvas. Painted by professional artists brushstroke-by-brushstroke with attention to all details. Order your Masterpiece today and get Free Shipping to your door direct from our studio.